After selling out the Bell Centre for the second time in as many events, you would think UFC president Dana White would be floating on cloud nine. 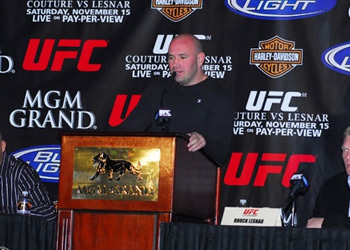 However, the outspoken White isn’t thrilled with UFC 97‘s headliners. What exactly about Silva’s uneventful unanimous decision win has White’s feathers so ruffled? The 185-pound king now holds the longest Octagon winning streak with nine, however has not looked right in his last two outings. The world’s most efficient and devastating striker has morphed into a passive and conservative fighter, and White is demanding answers. The contest was so boring that White would have fallen asleep cage side if it weren’t for boisterous fans inside the Bell Centre in Montreal, Canada. How dare they rain down such loud boos throughout the title fight. When fans used to gather around the water cooler discussing the world’s best P4P fighter, it was tough to not place Silva’s name atop the list. However, after his last two outings, who knows where he stands on that totem pole. Actually, White believes he knows. As for the champ, it was as though he was reading the same cue cards he used after his last fight.